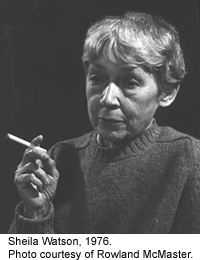 Sheila Watson is best known for her modernist novel, The Double Hook. With her husband, poet Wilfred Watson, she founded the literary magazine White Pelican in Edmonton where they both taught English at the University of Alberta and were very popular professors. Sheila was born Sheila Martin Doherty in New Westminster, British Columbia in 1909. She attended schools run by the Sisters of St. Anne. She earned a B.A., Honours in English (1931) from the University of British Columbia, an Academic Teaching Certificate (1932) and an M.A. (1933) with a thesis on Addison and Steele. During the next few years Sheila Doherty taught elementary school in a number of rural schools in British Columbia, including Dog Creek, the Cariboo, the inspiration for Deep Hollow Creek. In 1941 she married Wilfred Watson and after the Second World War she taught in Toronto, at U.B.C. and at Powell River, B.C. During 1951 and ’52 she lived in Calgary where she completed The Double Hook. For the next two years she lived in Edmonton and France. In 1957 she undertook doctoral studies at the University of Toronto and produced a thesis on Wyndham Lewis under the direction of Marshall McLuhan. In 1959 The Double Hook was published and soon became an important work. She was appointed to the faculty at the University of Alberta in 1961 and completed her dissertation, Wyndham Lewis: Post Expressionist in 1965. In Edmonton the Watsons became part of an active circle of writers and established the literary magazine, The White Pelican in 1970 along with Douglas Barbour, Stephen Scobie, John Orrell, Dorothy Livesay, and artist Norman Yates. The uncollected prose of Sheila Watson was published in a special number of the journal Open Letter in 1975, the year she retired from teaching. Her novel, Deep Hollow Creek, written in the 1930s was published in 1992. After Wilfred Watson retired in 1976 they moved to Nanaimo on Vancouver Island. Both Sheila and Wilfred Watson died there in 1998. In 2015 Joseph Pivato published, Sheila Watson: Essays on Her Works, the definitive book on her writing, editing and mentoring work.